Anthony Marrone holds a Ph.D. in kinesiology from the University of Michigan where he worked in both the athletic and nutrition departments. He began writing in 1985 and his writing has appeared in the "Journal of Strength and Conditioning Research" and the "American Journal of Clinical Nutrition." Powerlifting focuses on improving your squat, bench press and deadlift for competition. This requires strength and technical mastery. Powerlifting workouts involve training each lift, not focusing on body parts. Some programs have you train all three lifts in the same workout, others devote a single workout to a single lift. If you are new to powerlifting, a basic program that focuses on frequent practice of the three lifts should be your starting point. Consult a health care professional before beginning any exercise program. The Starting Strength program is a beginner's program that focuses on frequent practice of the squat and bench press. You train your squat and bench press three times a week. Due to the strain of deadlifting and the fatigue it causes in your lower back, the deadlift is trained less often, usually alternated with another lift. 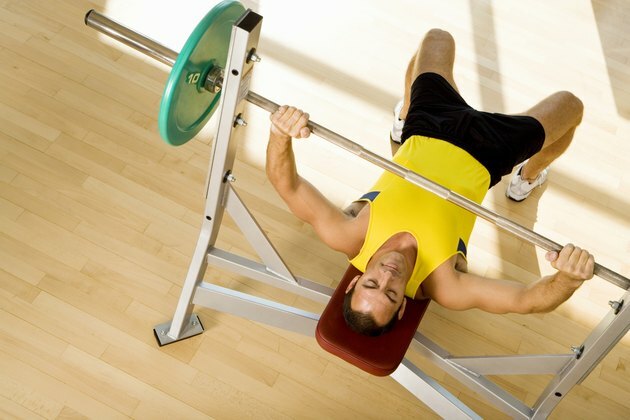 The frequent training of the squat and bench press allows you to build strength and improve technique while gaining muscle. The volume is low, often no more than three sets of five repetitions per exercise. Linear periodization is a method of training that begins with high-volume, low-intensity training. Over a period of weeks or months, you reduce the number of repetitions per set and increase your training weights. The goal of a periodized cycle, which can run from six to 12 weeks in length, is to set a new personal record on your squat, bench press or deadlift at the end of the training cycle. The length of the cycle will vary with your goals an experience. Longer training cycles are favored by more experienced athletes. This type of program is adaptable beginners and intermediate athletes. Sheiko routines are powerlifting routines designed by Russian coach Boris Sheiko. These programs involve training with high volume and moderate to high intensity. The weights on your main exercises are often 80 to 85 percent of your one-repetition maximum, but can increase to 90 or 95 percent during special training cycles. These programs also have very specific assistance work, such as lunges and back work to promote flexiblity and increase your ability to recover from the training volume. These programs are not for the beginner, and intermediate lifters may be advised to adjust their training intensity down slightly until you can tolerate the training volume. The Westside barbell system is the most complex method of training and requires a thorough working knowledge of a variety of exercises and critical self-assessment. This program is based around dynamic and maximal effort days for your squat and bench press. On dynamic days, your goal is to move the weight explosively, and on maximal effort days you strain under limit weight. Your exercises are rotated regularly, and you must carefully select the exercises that allow you to progress. Assistance work, such as exercises for your hamstrings and triceps, is also up to you, so you need to know what you are doing to get the most out of each training session. How Much Are You Supposed to Deadlift for Your Body Weight?